As predicted, it had been a cold night with the surf pounding loudly all night long. Despite my 15 degree sleeping bag, I slept with my puffy jacket on for extra warmth. I had set an alarm so that I would not miss the sunrise, but I was hesitant to venture out into the cold when it went off. I didn't want to regret missing it later though, so I hauled myself out of my sleeping bag at 6:45 am and walked down to the beach in the dark. The bay was rough as the wind blew relentlessly from the open lake. I watched the sky lighten and change color while waves crashed on the beach. I had gotten up just in time; by 7:15 the show was over, and I headed back to the shelter to make coffee. I appeared to be the only person up and about. We spent our third day on Isle Royale relaxing and exploring more of the area around Siskiwit Bay. Though it was late in the season, a few types of berries and wildflowers could be found around our campsite. I had seen a few clumps of blueberries near the fire tower on the Feldtmann Ridge the day before, but there were none here that I found. The last time we were here in September, thimbleberries were plentiful, but not this time. While thimbleberry plants and raspberry bushes were scattered all over, the berries themselves were harder to find. There are a few apple trees at the Siskiwit Bay campground, which was surprising to me. I learned later from speaking with Ranger Valerie that they were planted there sometime in the 1930s when the Civilian Conservation Corps had a camp in that area. Apple trees can be found in a few other spots on Isle Royale where the CCC also had camps. Daisy Farm was one location, and there were one or two others that I can't remember now. We ate a couple of these small apples for the sake of doing it, but they were extremely tart. I investigated the individual tent sites, which I had not seen the day before. Site #1 is great. It has a view of the bay, a picnic table, and a flat, shaded spot for a tent. This would be a really nice place to camp, and although I felt lucky to have scored a shelter the day before, I would have liked to pitch my tent here. Sites #2 and #3 were a bit further into the woods and away from the water, but also nice. They were both secluded, spacious and had good tent pads. On the other side of sites #4 and #5, which are the two shelters, site #6 is much further back in the woods and not as appealing as the others. The tent sites were all deserted early in the day, as everyone who had camped here the night before had moved on. It was sunny for most of the day, but it remained windy and did not warm up much. 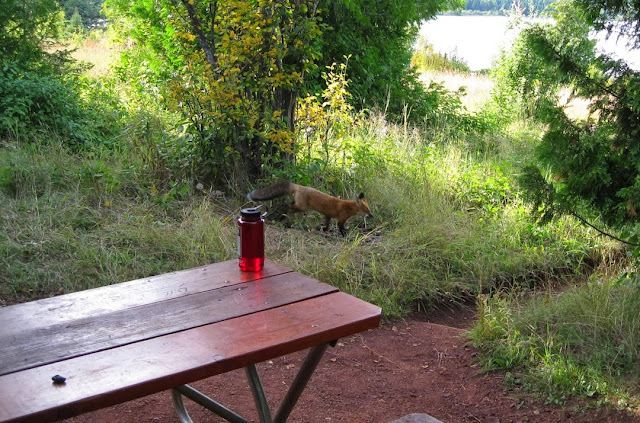 The fox returned when we were getting ready to make dinner. An interesting animal and obviously a professional thief, it seemed to never stop moving. It didn't approach us or linger; it trotted through camp, efficiently assessing the situation to determine if anything could be easily pinched while seeming aloof at the same time. It was as if we were not even there. Later that afternoon, some hikers down by the fire ring reported that it came up to the picnic table while they were sitting there, looked all around them for food, but ignored them the whole time. To be continued in: Day 4 - Siskiwit Bay to...?